As my fellow Tweedster Paul the Geek is wont to do, today I’m bending the rules to induct a television character into the Movie Character Hall of Fame. I don’t know who decided it would be a movie character hall of fame, but I think it’s stupid. Why discriminate against all the great TV characters out there? That’s… mediumist! Yeah, we’re gonna go with that. Any woman between the ages of 25 and 45 will be quite familiar with today’s inductee. 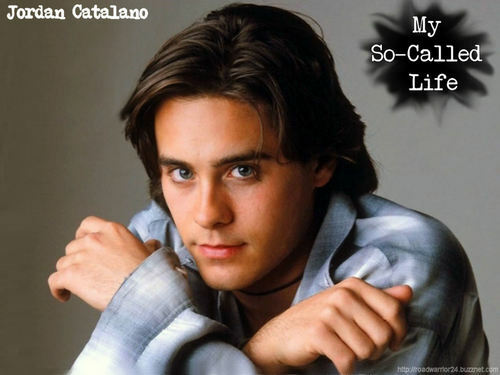 Our teenage years were forever altered when Jordan Catalano (played by Jared Leto) first walked onto our TV screens. We were all Angela Chase, and he was the beautiful, brooding bad boy with a heart of gold that we were all dreaming of. Those eyes! Those lips! That voice! My So-Called Life was the voice of a generation. So many teenage girls watched and saw their own lives reflected back. Angela Chase was our heroine, and we lived vicariously through her for 19 amazing weeks. Her friends were our friends, her struggles were our own, and her longing for Jordan Catalano mirrored that of our own crushes. She gave voice to all the doubts, insecurities, and self-discovery that we struggled to express in our own lives. Jordan Catalano was the perfect object of her affection. Mysterious, withdrawn, complicated, and so beautiful it hurt to look at him, we saw in him the boys we loved in our own lives. If Angela could make it work with Jordan, if she could draw him out of his shell, then maybe, just maybe, we could do the same. Sadly, My So-Called Life was cancelled before its time, and we never got to see the end of the Angela & Jordan story. Also, sadly, Jared Leto has not inspired much Jordan Catalano-styled lusting since then. Though he’s made a name for himself as a successful musician, he’s also turned into a Grade A, First-Class Douchebag (seriously, just look at this guy). But I and so many others will always think fondly of Jordan Catalano. We will remember him as our first grown-up crush, as the one that got away. We each have our own Jordan Catalano, and he will be the boy we think about when we’re 80 years old and looking back on our lives. Jordan Catalano was the focal point of all our teenage hopes and anxieties, and for many of us, he will always be a symbol of a time long passed.